It takes decades, and even centuries, to overturn the Catholic canon of law, but medical journals move much more quickly: Just three weeks after the Virology Journal published a paper speculating that a woman described in the Bible as being “cured by our Lord Jesus Christ” had flu, the journal has apologized for ever posting it online. As Editor-in-Chief of Virology Journal I wish to apologize for the publication of the article entitled ”Influenza or not influenza: Analysis of a case of high fever that happened 2000 years ago in Biblical time”, which clearly does not provide the type of robust supporting data required for a case report and does not meet the high standards expected of a peer-reviewed scientific journal. Virology Journal has always operated an exceptionally high standard of thorough peer review; this article has clearly not met these thresholds for balance and supporting data and as such, the article will be retracted. I should like to apologize for any confusion or concern that this article may have caused among our readership, or more widely. Whilst only ever intended as an opinion piece and also a bit of relief from the ‘normal’ business of the journal, the speculations contained within this article clearly would be better expressed outside the confines of a peer-reviewed journal. Biomed Central does not support any views outlined in this article. O’Hara’s tongue-in-cheek yet exasperated analysis of the paper is worth the read and deserves the traffic, so I will send you there instead of quote it extensively. But let’s just say it includes a reference to a sentence in the paper pointing out that Luke could not have quantified the woman’s temperature because the Fahrenheit scale was not devised until 1724. We’ve emailed the lead author of the study for comment. The authors of the original source material — Mark, Matthew and Luke — could not be reached. I was astonished that our article, submitted initially in the debate section of the journal, had stirred up such negative publicity. As an article for debate, there was no absolute right or wrong answer, and the article was only meant for thought provocation. Neither was it meant to be a debate on the concept of miracles. My only focus at the time of writing was “what had caused the fever and debilitation” that was cured by Jesus. I was especially astonished that so many comments were made outside the scope of the journal. In medical writing, colleagues would usually make comments in the “letter to the editors” and the authors would respond in the subsequent correspondence. I once again am very sorry to have caused inconvenience to the Journal and anxiety to myself. I think I will never write this type of article any more – not worth the hassles! meant for thought provocation. Neither was it meant to be a debate on the concept of miracles. My only focus at the time of writing was “what had caused the fever and debilitation” that was cured by Jesus. I was especially astonished that so many comments were made outside the scope of the journal. In medical writing, colleagues would usually make comments in the “letter to the editors” and the authors would respond in the subsequent correspondence. Man. Angry atheists sure are a humorless bunch. Oh well. I guess we had too much wonder and goodwill in the world, and they had to correct that. Hmm, most of the reaction I saw was amused piss-taking… mind you, I didn’t read every single post. Nowhere *near* as humourless as angry christians. For wonder and goodwill, I recommend you have a look at John Calvin’s Geneva. Is a science journal the correct place for ponderings of a religious nature? When “ponderings of a religious nature” impinge on what the rest of us call the “real world”, when it makes empirically testable claims, when it says anything at all about physical reality, then yes. Of course … religion cannot escape discussing physical reality, because that’s what people really care about. Christianity’s promise of salvation for your immortal soul would never have caught on if it had not also promised healing for your mortal body. I think this is just a bit silly. How many times have ‘reputable science journals’ posted retrospective diagnoses of historical figures? Dozens. But when it’s from the Bible, everyone freaks out. there is a difference between historical figures and fictional characters. Even if you had any proof that these three books, which have independent historical records for several of their mutual characters (Jesus, John the Baptist, Herod etc.) shared a fabrication of this figure, still your point would be moot. Actually, there are no reliable independent historical records for Jesus of Nazareth (those in Josephus were interpolations by later scribes, and all other candidates suffer similarly under scrutiny) although you are right that Harod and John the baptist appear to be verifiable historical figures – though their acts as recorded in the NT are not recorded elsewhere. Interesting that none of the contemporary histories mentioning Herod managed to record such a significant act as his slaughtering of all the infant males of Bethlehem. Luckily we have Matthew the Evangelist – that noted historian – or this important event would have been lost to history! I will have to bear in mind that mentioning a real person bears evidentiary weight when analyzing whether a literary artifact is fictitious. Come to think of it, there are several independent historical records of Richard Lionheart. I must re-evaluate the reliability of the Robin Hood records. The point, Meisnerman, is that there is insufficient evidence to say WHICH of the figures in the Bible do NOT exist. To call them fictional is as ridiculous and biased as the belief in the ‘inerrant Word of God’ stance that is being mocked. Yes, I got your point Barry. I just disagree. Your claim that both ‘fiction’ and ‘inerrant Word of God’ are equally ‘ridiculous’ could only arise from special pleading and evidentiary standards which would never be accepted when judging other works. Do I really need to make a list of the stories ‘recorded’ in the Bible that are openly fantastical, magical, and at odds with physical laws? Surely you are aware of the many biblical tales of major world events which are conspicuously lacking from – or at odds with – other historical records and archological data? Countless events in the gospels alone would immediately be classified as fiction ON THEIR FACE if they were attributed to a character named ‘Steve’ and not ‘Jesus’ – or if they appeared in any non-sacred text – or if they were judged by any objective standard except the standard of faith. Even if a historical person named Yeshua of Nazareth existed with some corollation to the Gospel character(the evidence is VERY sparse – much less than might be expected for so prominent a figure as is described in the NT) the biblical account of his life and exploits would still be highly questionable. Yes, King Herod existed, but the Herod in the story of the ‘slaughter of the innocents’ is more likely a fictional character of the same name. If I write a series of tales about a tiny man named Barry Norton who lives in my laptop and disagrees with me, the fact that you are a real person would not make my character any less fictional. If I publish my tales as non-fiction and mention Obama and Oprah, will you say it is ridiculous to call them fiction without proof? The most parsimonious explanation of the facts in evidence is CLEARLY that the Gospels are more fiction than history. The burden of proof lies with the maker of a claim, not the skeptic, and extraordinary claims require extraordinary evidence. “The most parsimonious explanation of the facts in evidence is CLEARLY that the Gospels are more fiction than history” – I agree. “The logical default position for any miraculous claim is ‘fictional until PROVEN factual’” – no. Even formal logics encode ‘yes/no/unknown’ and ‘definitely/definitely not/very unlikely/…’. And, in any case, you’re trying to shift the emphasis from the character to the event (remember I responded to “fictional characters”) – unfair, as even you (struggle to) admit that Herod was real while the miracle concerning him is suspect. 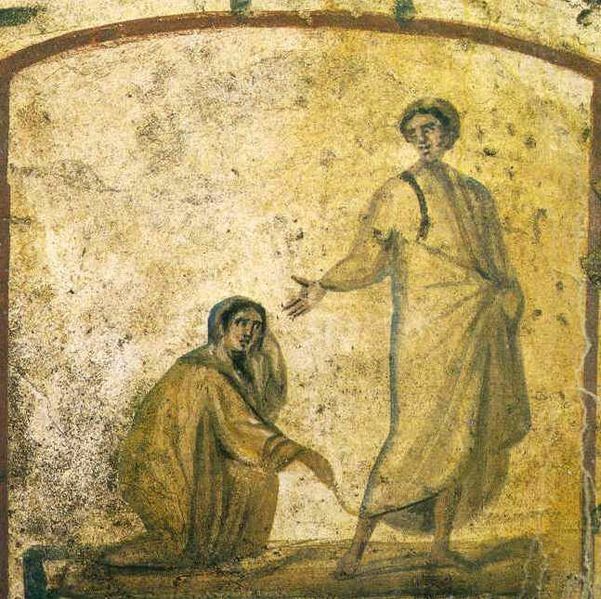 If we talk in probabilities (of basis in some real person with a real medical condition, however embellished with legend), how would you rank a character in the gospels versus a character in the Homeric epics? Shall we have Thoma’s paper pulled too? No, I don’t believe I am ‘shifting the emphasis.’ I think you misplace it. We need not enter into the search for a historical Jesus to discuss whether the character in this healing tale can fairly be called ‘fictional’. This is exactly analagous to the situation with attempts to establish a historical Jesus. Would you call it ‘ridiculous’ to say Robin Hood is fictional in any given tale of his exciting adventures? Oh and ‘yes/no/unknown’? Really? You think ‘unknown’ would be a more appropriate classification than ‘no’ in a case like this? No matter haw strict you may want to be that we don’t techinically ‘know’ well…anything, miracles are a special case. I prefer Hume’s treatment of the subject. The Homeric epics and Thoma’s paper are irrelevant to our discussion and I have no strong opinion to your larger original point that medical analyses of fiction have been published in the past. I took issue only with your assertion that one should have ‘proof’ before calling this story ‘fiction’. Absolutely. Then we don’t suffer from ‘fictions’, such as giraffes, becoming real through further evidence. Notice I’d explicitly even concede ‘likely fictional’. But fictional, as I said, is as biased as the biblical literalists. False equivalence. These two presumptions are not even close to sharing the same level of bias. Different by many orders of magnitude. The first ‘bias’ is justified by Occam’s razor, by the available evidence, and by any reasonable assessment of the burden of proof. You might say that American jurisprudence is ‘biased’ toward the defense, but it is still incumbent on reasonable people to presume innocence. The second ‘bias’ is unjustifiable by any objective standard – requiring faith in the unknown and unknowable for acceptance. I’m ALWAYS open to further evidence, but that doesn’t stop me from making reasonable inferences from the facts at hand. If I’m wrong, I simply revise my opinion with apology. Where is the harm? Classifying something as ‘unknown’ when the overwhelming preponderance of evidence points one direction may pedantically be correct, but unhelpful and vaguely dishonest. It surely gives an unnecessarily false impression about the actual state of knowledge. For every giraffe, there are countless dragons, unicorns, pixies, griffins, yetis, and Loch Ness Monsters which are correctly consigned to cryptozoology – pending further evidence. Where could the harm come from in classifying a figure as fictional without any evidence, when are counter-examples to show that you could be wrong, and where you offend the faith of millions? I’m not going to get into a religious argument, but if you don’t want people to be fundamentalists (as I don’t), you don’t try to push them to the other extreme. You dould always be wrong. Always. but you have to make assertions sometimes or you get nowhere. ‘Could be’ is not the same as ‘remotely likely to be’. Literally every scientific conclusion ‘could be wrong’. It’s built into the method and goes without saying. We never make any assertion of knowledge in science without the understood caveat that future evidence could force a revision. Using your approach we could never aver anything or make any progress at all. Ah, now the real concern is voiced. By all means let us not risk ‘offending’ millions by simply and honestly stating the facts as they are currently understood. Aren’t you worried that asserting the deity of Jesus – as the books in question do – will offend Millions of Muslims? Or Hindus? Or Scientologists? Believers seldom seem too concerned that their faith-based assertions might offend those with other faiths or with none. Why should frankness and honesty about our state of knowledge be offensive? Don’t we just feed the foolish notion that offense is more important than truth when we twist our presentation for accomodationist reasons? Since when is scientific truth subject to a sensibilities test? And in my experience, people choose fundamentalism readily enough without any pressure from me. I’m more interested in making a clear and concise case for rationalism without fudging to accomodate peoples ‘feelings’ and making scientific forums such as this one a hostile environment for poorly supported assertions. I was all ready to argue with David Waldock, and agree about “angry atheists”, until I read past the abstract (which I find perfectly justifiable). Not Science. Not publishable as science. Next we will find out that National Geographic have been sending out expeditions to look for Mordor. Oh, they did. They ended up in Scunthorpe. Or Pittsburgh. In your zeal to criticize this (admittedly odd) paper, you seem to have completely distorted its subject matter. Why else entitle your blog post “Virology Journal withdraws paper about whether Christ cured a woman with flu” when the paper in question is absolutely not about whether Christ cured the woman? FWIW, the paper appears to be about whether the woman’s ailment was flu or not, and is not really concerned with whether or not she was healed. Poorly peer-reviewed papers are one thing. Misleadingly titled blog posts based on complete fabrications are not much better. True… on the post title. But would ‘Virology journal withdraws paper about whether it was ‘flu that Christ cured a woman of’ really have made that much difference? A case study? Sure. A proper trial? No. For that, you have to look elsewhere. Like: 1 Kings, chapter 18 (plausibly written mid-6th cent BC), where a trial is conducted between gods, with the outcome being the start of a sacrificial fire, as observed by a host of witnesses. Or Daniel chapter 1 (conservatively dated around 2nd cent BC), where a vegetarian diet intervention is tested, with the outcome being vitality between two groups of young men, as observed, again, by a host of eyewitnesses. There are three beliefs being confused here. One belief is that science is a method for developing an ever-more certain, accurate, complete model of the physical world. Another belief is that science is a method for developing an ever-more certain, accurate, complete model of the world, including the physical world, but also including the metaphysical world, including supernatural phenomena, if there is a supernatural force at all, such as physical-world-defying curative miracles. Yet another belief is that there is no world other than the physical world, and so science ends up being the best method for understanding the world entirely, since science works for the physical world and the world is all physical. Each of these beliefs is a belief. It is circular to use science to prove that the world is physical only, since science is only adequate for evaluating claims of knowledge about the physical world, and so science is the best method for ecaluating claims of knowledge bout the world since science works for the physical world. Until you can demonstrate a ‘reliable method’ – apart from science – for modeling the ‘metaphysical world’ or even for determining if one exists, it is ridiculous to claim that each of these beliefs is ‘just a belief’. Any ‘belief’ which includes the existence of a ‘supernatural’ is orders of magnitude less supported and reliable than one based on materialist assumptions. They are NOT on the same level. Just because I can imagine something which can’t technically be disproved doesn’t put my claim on par with verifiable fact. Especially if every claim arising from my imagined idea which CAN be tested proves false. I belive it was St Augustine, who on being asked about the spiritual status of unicorns and other semi-sentient demi-humans, replied that we should first establish for sure that there are such things. My only focus at the time of writing was “what had caused the fever and debilitation” that was cured by Jesus. I saw this guy yesterday, and he had, like, yellow pustules a croaky voice, and his feet were too small. That’s far more information than is in the bible story, so I am sure the estimable Ellis Hon will have no difficulty diagnosing his condition. The fact that I simply invented this person and his malady, that it is a complete fiction, will surely be no impediment. Permit me to recommend “The Homeric Epics and the Gospel of Mark”, Dennis R MacDonald. I believe the atheists MUST be **investigated** because of their METHODS to **target and attack** medical journals. In Scientific circles that is unlawful. Back to the paper. If the paper only focuses on trying to identify or narrow down the illness based on the symptoms, then its legitimate. Whether or not the bible is truth or fiction does not matter. An analogy would be calculating the power of a star destroyer blast based on footage of it shooting at asteroids in Empire strikes back. The ESB is fiction but the math and the reasoning used to arrive at the answer is sound. This is one of the comments which led to the removal of the article. If you will notice she uses her position at the University in her comment but fails to declare her ‘conflict of interest’ which is she is an activist atheist. Title: This is not science. This paper in no way qualifies as science. It doesn’t even qualify even as a case report, because the authors have no personal experience of this case. They basically say that, if their assumption that the woman had influenza is correct, then their conclusion that she was cured is justified. The citations are also disgraceful. The authors cite only the bible, a web page about temperature measurements, and themselves (seven times!). If BioMed Central hopes to build a reputation as a home for serious science then they need to first withdraw this paper and then have some serious discussions with this journal’s editor. Influenza or not influenza: Analysis of a case of high fever that happened 2000 years ago in Biblical time….has still not been retracted and can be accessed and downloaded online…? is this normal?